Size:21" tall (23" including horns) standing; 10" tall (12" including horns), sitting. 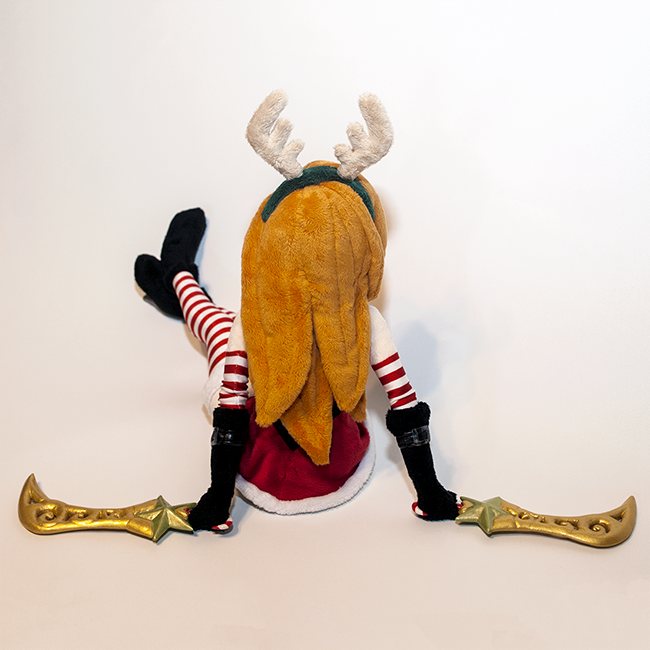 A plushie of Katarina in her holiday themed Slay Belle costume, from the popular online game League of Legends. The plushie is made from minky and filled with high quality stuffing for a soft, cuddly touch and bubbly look. Her entire outfit is carefully sewn together and attached permanently to her body, so that it retains perfect shape. Her eyes are hand sculpted from plastic, and custom painted and finished with a clear gloss for realism. Katarina's weapons are made exactly how I would make a high quality one-of-a-kind cosplay prop, only at a tiny 6" scale. They are hand carved from EVA foam, coated with a layer of worlba thermoplastic to make it strong and sturdy, filled with primer filler and sanded smooth, painted with high quality gold and green paint, and finished with a clear gloss for extra shine and protection to the paint job. Her hands have magnets in the fingers, and are designed to close around her blade so that holding the weapons is optional. Please note that Katarina has a floppy design with no wire armatures, and cannot stand on her own. Since she is floppy, her limbs have a lot of movement if you want to play with her, but she will not hold dynamic poses on her own. She is intended to sit when displayed, or rest in a doll stand. The example pictures of her sitting down are her natural state, and the standing ones are created with the aid of strings to stand her up, to show her flexible design.